Categories are an important tool for organizing and structuring the elements of the AxCMS.net, and the base for the creation of protected areas or dynamic controls. To create a new category, go to New -> Category OR Edit -> Categories and select New Node. Enter the name for the new category. These fields are by default without function. Each category gets a unique ID after saving. Here you define whether the new category will be inserted in front of, behind or under the marked category in the category tree. Statement Where do you want to insert category node ? Here you can assign a category to your new category. 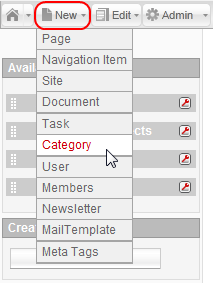 As categories are objects in AxCMS.net, you can assign categories to them. Here you can open a page where you can see the rights of users. 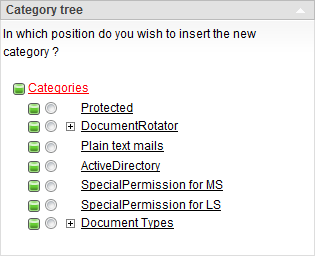 Statement In which position do you wish to insert the new category ? Within the category tree you can select the point to enter the new item. The colored icons represent the status of the items. The meaning of the colors is explained in the Legend section on the left side. After saving, the new category will be visible in the tree. Saves the category and takes you back to the Category Overview page. 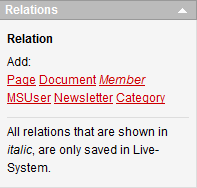 Saves the category and reloads the Category Detail page. Takes you back to the Category Overview page. No changes will be saved. 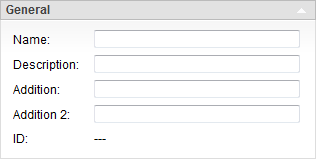 Opens a detail page with empty fields for creating a new category. 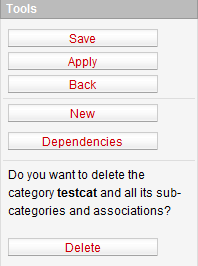 Allows you to view and edit the dependencies of this category. Lets you delete the selected category. Here the status icons are explained (same as by navigation). This section becomes visible only after saving. 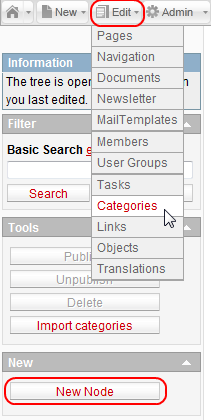 Here the new category can be related to Pages, Documents, Members, Users, Newsletters and Categories.